NYSID’s 2016 commencement ceremony took place Wednesday, May 18 at the NYU Skirball Center for Performing Arts. The Class of 2016, along with their friends and families, were treated to a candid address by designer Alexa Hampton before crossing the stage to receive their diplomas. Read Alexa's entire speech and view photos from commencement here. 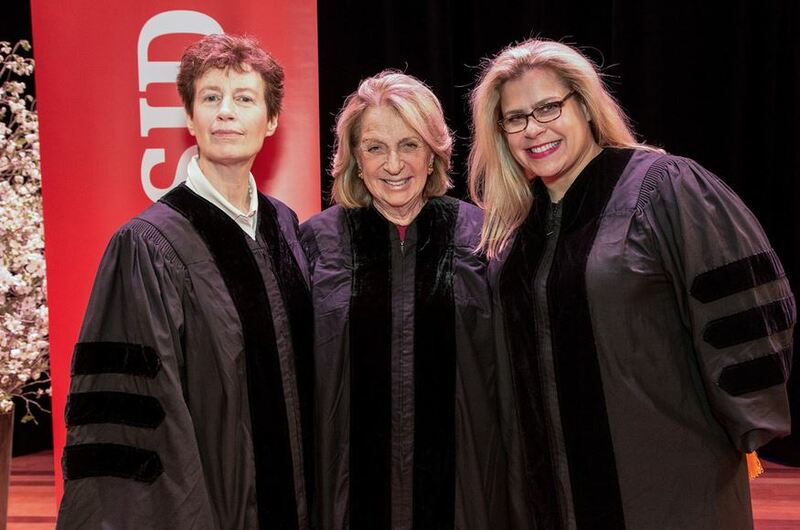 Honorary doctorate degrees were presented to Alexa Hampton; Wendy Goodman, design editor at New York Magazine, and Daisy Soros, NYSID alumna and philanthropist. With humor and humility, Hampton shared anecdotes of her career that included everything from her rocky start taking over her father’s design firm to exploring new design ventures. Her best advice served as an earnest reminder for the importance of having a well-rounded career: “The best way to be happy and fulfilled is to be kind and hardworking and empathetic to those around you. Have a happy workplace, love your colleagues, treat your vendors with humor and gratitude, and respect the hell out of your clients. Then you will quickly discover that you are already a success because living and working is a joy.” Read Alexa Hampton’s entire speech here. The Chairman’s Award, which recognizes outstanding creative achievements of students on the graduate and undergraduate level, was given to Jacky Po-Chi- Chen (MFA-2) and Yiqing Liu (MFA-1) and Samantha Pendelton (BFA). The Ana Blanc Verna Award for Excellence in Interior Design, established to honor the memory of Ana who was a distinguished graduate of the College, was given to Sol Seong (BFA). BFA graduate Krista Gurevich (MFA-1) was the recipient of the Alumni Award, given to an academically outstanding graduate who has also performed exceptional services to the College. This year’s Robert Herring Travel Prize, which was established to raise awareness of the value of foreign travel as part of a designer’s growth, was awarded to Vivian Rosenberg (BFA) and to Joe-Hynn Yang (MFA-1), who also won this year’s Nancy Short Award. Each year, NYSID also honors one of its faculty members with the William Breger Faculty Achievement Award. This year, the award was given to Donna Goodman, an interior designer, scholar, writer, and filmmaker who has taught at NYSID since 1995. Congratulations to all the 2016 graduates, honorary doctorates, and award winners for their inspiration and excellence!